Location: Bricklieve Mountains, Co. Sligo, Ireland. Grid Reference: 54° 03.2' N. 08° 22.5' W.
There are 14 passage mounds at Carrowkeel, all in different stages of construction. Although the site suffered an explosive assault in the 1911 'digs', there are enough remains to show us that this was once an extremely important part of the Neolithic Irish landscape. 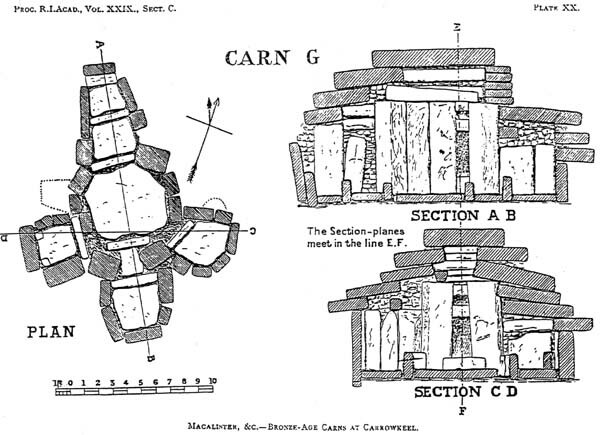 The passage mound (Cairn G), was demonstrated by researcher Martin Byrne, to have a 'light-box' which is similar in design to the light-box at Newgrange, and was constructed so as to allow the light of both the the sun and moon to penetrate the inner chamber. (The sun for a month on either side of the summer solstice, and the light of the full moon on either side of the winter solstice) (1). Carrowkeel: ('An Cheathrú Chaol', 'The Narrow Quarter'). Carrowkeel is a grouping of 14 cairns/passage mounds, with circumstantial dating placing them at around 3,400-3,100 BC. Unfortunately, much of the site was 'vandalised' in 1911 by R. A. S. Macalister who thoroughly attacked them on behalf of the Royal Irish Academy. He and his assistants employed sledgehammers and high powered explosives in a two week archaeological frenzy. Although the site has 14 cairns and a substantial bronze-age 'village' below it, the complex has been neglected and following the 1911 digs, all that remains today is the ghost of a memory, with only a few cairns left worth visiting. The outstanding views however, from Carrowkeel offer a different view of the landscape in which connections between the prehistoric sites were reinforced by astronomically significant orientations. In particular, in the case of Carrowkeel, the distant hill of Knocknarea seems to have been of great importance to the builders of these monuments. The most complete of the Carrowkeel complex, is a classic example of a corbelled, cruciform passage mound, it was built with a large 'portal' stone in front of the passage, with just enough of a gap to allow a person access to the chamber, and with a curious slit like hole in it (most of which is covered today). 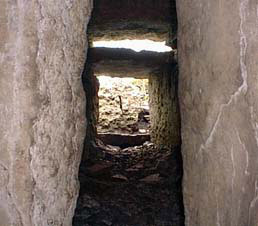 It is suggested that light reflecting off the mica stones at the back of the chamber might have in turn reflected light back out through the hole, a theory, which if substantiated one day, would make this the only known example of its kind. 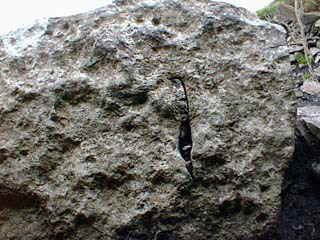 The curious hole in the Carrowkeel 'portal-stone', mostly covered on the front-side. The Light-box - Cairn G.
Martin Byrne is the re-discoverer of both the solar purpose of Cairn G at Carrowkeel on the Summer Solstice sunset and the lunar function of the same cairn which demonstrates that moonlight will enter G and hit the end chamber wall at the extreme Northerly lunar standstill point. The location and orientation of the passage mound was clearly important, and 'capturing the light of the Moon' may have been the main purpose of the construction - as it is orientated to a hill called Knocknarea, which means "Hill of the Moon", which is in-line with the most northerly point the setting Moon reaches on the horizon, ('lunar standstill'), an event that only happens every 18.6 years (suggesting a long construction or preparation time). The light-box from inside the chamber. The passage is much shorter than Newgrange, only about two meters long, and so the roof box opens directly into the chamber. This means that the sun can shine into the chamber for a much longer period of time than Newgrange - approximately a month on either side of midsummer, though it only spends about two weeks in the rear of the chamber. 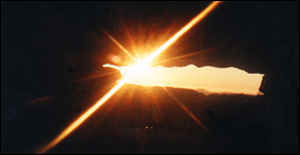 Also, even though the sun has been displaced by 1.5 degrees (three solar diameters) to the west, it is impossible for the midsummer sunset to have shone into the end recess of Cairn G. In the photograph below, the sunbeam is shown in its maximum position, centred over the left recess, and this is probably pretty much as it was in ancient times. The full moons rise and set approximately 180 degrees opposite the sun's rising and setting positions. The setting full moons on either side of the winter solstice will illuminate the chamber of Cairn G in much the same fashion as the sun does each summer. Cairn E - Is a composite of a court cairn and passage cairn. The northern end of Cairn E houses a ruined passage with a cruciform chamber which, like Cairns B, G and K, is aligned to Queen Maeve's Cairn on top of Knocknarea, on the horizon. Astronomy - While the passage and chamber are oriented to Knocknarea at 337°, the long body of the cairn is aligned on a different axis - 329.5°, quite close the axis of the midwinter lunar standstill setting azimuth. The mound laid out on the summer solstice sunset/winter solstice sunrise axis. Once every 18.6 years at the winter solstice, the full moon will set behind Croghaun, and moonlight may illuminate the left side of the cross-shaped chamber. Then, looking south-west along the axis of the cairn, the winter solstice sun will rise over the court shaped structure. Cairn K - This monument, along with Cairns B and G is the most intact structure at Carrowkeel and is an excellent early example of the classic cruciform corbelled chamber with a capstone 3m above the floor. Up until a few years ago there was a lot of white quartz around the north face and entrance of the cairn. but most has been removed by visitors, probably for souvenirs. This quartz would have been used to cover all of the cairns - see Newgrange for an example. And this is probably how the mountains got their name ('Breac Sliabh' means Speckled Mountain), and anyone standing on Knocknarea or any of the peaks of the Ox Mountains would have seen the monuments in Carrowkeel reflecting the light of the sun or moon. 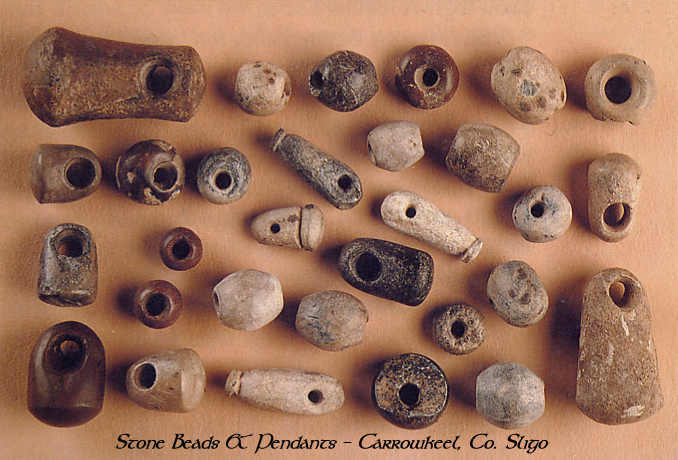 Some of the discoveries from Carrowkeel. 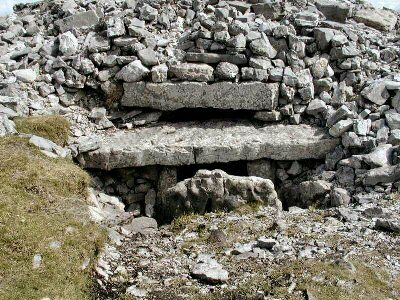 Sill-stones - Several of the cairn's at Carrowkeel have half-buried sill-stones in the ground which appear to divide the chambers from the passages, and sometimes even divide the passages into sections. The same design feature can be seen on sea-faring ships today. The Gavr'inis passage mound in France has a sill stone in the corridor floor with 9 'X's' carved into its face. Only the top halves are present to today, but it is an architectural feature with a symbolism mirrored at several Irish passage mounds both in terms of art and construction.